This is the second chapter of an ongoing project that upends the typical nature of the retrospective exhibition. Not only is the Bulgarian performance artist Zhana Ivanova (b. 1977) at the beginning of her career (and not, as is usually the case with such shows, already renowned), but her exhibition is being staged chapter by chapter, over many years, creating a retrospective in reverse that only fully takes form over time. 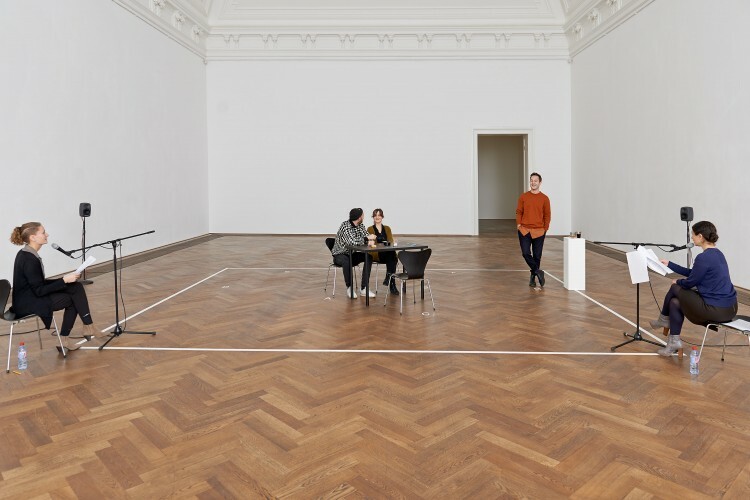 Whenever the artist believes that one of her new or older works “belongs” in her survey show, we begin planning how and when to stage it at Kunsthalle Basel. This unusual project exposes the conventions of the retrospective and finds its foundations in the work of the artist herself, specializing as she does in performance-based pieces that reveal the unwritten but omnipresent rules, codes, and systems in society. 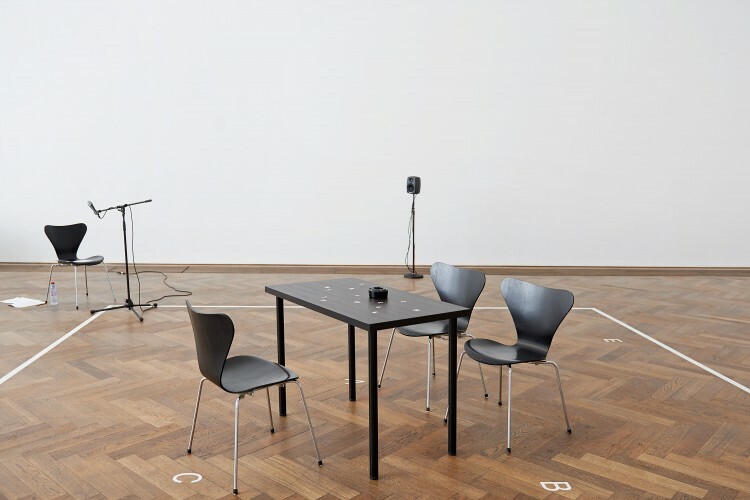 After having inaugurated the first chapter in 2015, Kunsthalle Basel now presents chapter 2. 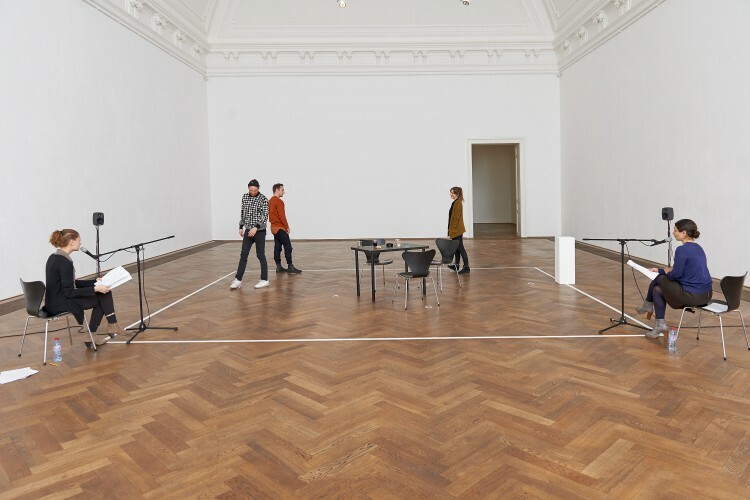 Here Ivanova restages her very first performance piece, Borrowed Splendour, from 2007, in which she forged what would become her signature use of acute observation, instructional scripts, and meticulous but open-ended procedures. 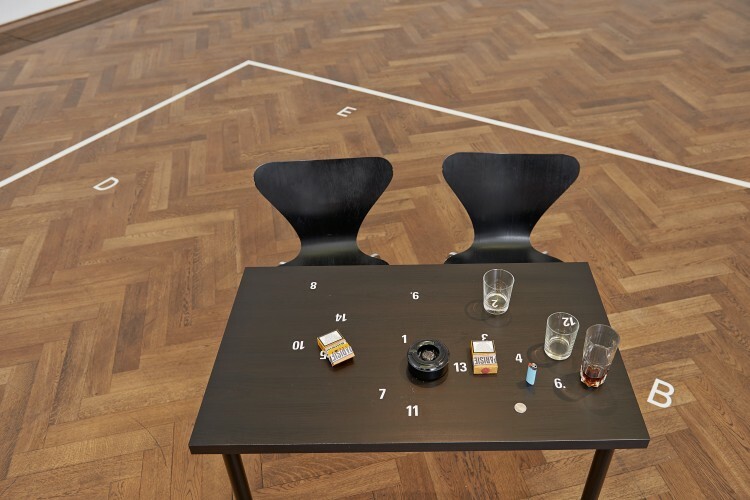 The piece’s elements are sparse: a table with pre-set markings, some chairs, everyday items (ashtrays, cigarettes, drinking glasses) two performers cast as “instructors”, and a new set of three volunteers for each twenty-minute staging. 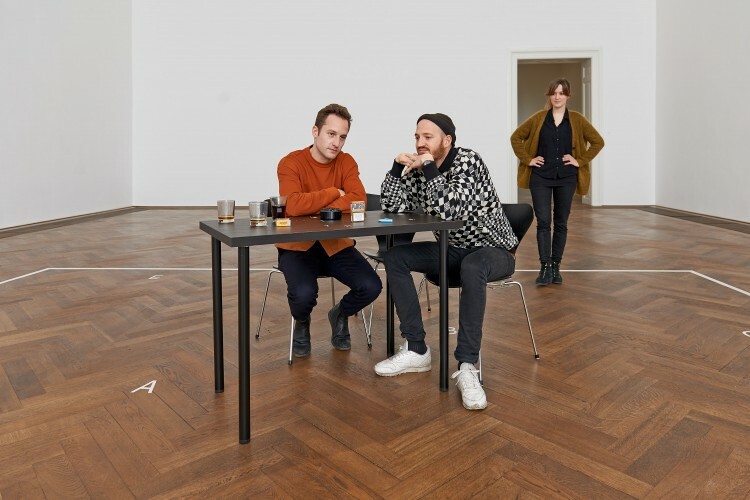 And while it might appear to be a theater piece of sorts, it is better understood as a conceptual artwork in which Ivanova’s construction of an artificially induced situation makes gender and power dynamics visible. These “public demonstrations,” as she calls them, aim to bring forward the processes that lead to the production and interpretation of meaning. Thus, besides representing human behavior, Ivanova is also interested in producing it, and in so doing, uncovering how we perceive the social signals shared among us every day. So begins Instructor A, who then reads off a series of ordinary tasks for each of the three volunteers to follow, including walking toward the table, sitting in position, and crossing their legs. 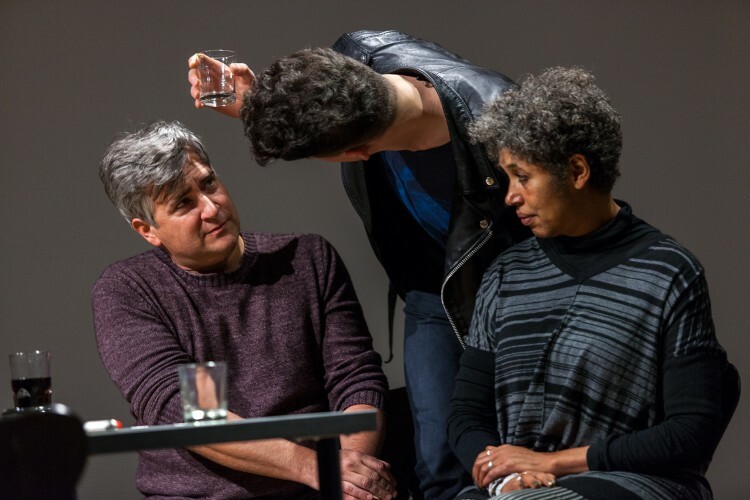 These participants—two men and one woman—never see or rehearse the script before, and thus they, like the audience, discover their actions together. Quickly the instructed tasks become loaded and socially over determined, including head tilting, deep breathing, and long gazes between participants—the kinds of gestures that convey 1irtation or uneasy encounters in which attraction, competitiveness, or anger between people are expressed through micro movements and body language. “Think violent thoughts” another directive from the instructor announces. The person on stage responds, either thinking such thoughts or enacting what he believes some- one thinking “violent thoughts” might look like, or simply refusing to think such thoughts at all (we might never know). 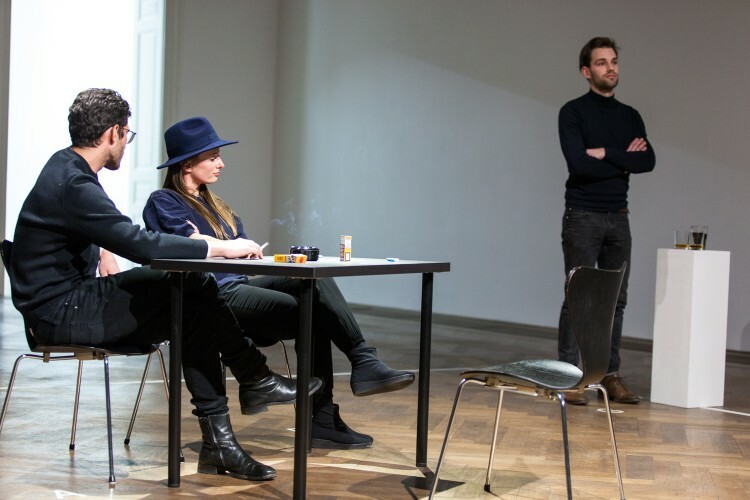 The volunteers’ individual interpretations of their stage personae and the ways in which those personae reproduce conventional behavioral models and gender clichés are as much a part of the intrigue as the directed instructions they hear. study of linguistics and her initial career as a translator for the police. So too does the formal language of cinema sits in the background of several of Ivanova’s works. to staging, or modeling scripts on scenes from popular movies, Borrowed Splendour borrows many of its gestures from a bar scene in Jean-Luc Godard’s film Bande à Part. But unlike a classic movie, Borrowed Splendour intentionally resists climax, resolution, or closure. It hinges on the conjunction of determinacy (extremely concrete instructions) and uncertainty (the enigma of how people will understand what is addressed to them). Just as in life, the particularities of individuals, their reactions, and the way in which they follow or resist instructions are counterpoints to a world in which some things are highly ordered and others are entirely beyond our control. It is a world where mastery of circumstance is 1eeting, and where splendor is always only merely borrowed.